A prompt from artist Helen de Main. To participate in Interface Gallery’s current show Make Things (Happen), follow three easy steps. 1: Take an activity sheet. 2: Make things, or make things happen. 3: Share your results. The interactive show was organized by artist Christine Wong Yap, who gathered more than forty artist-designed activity sheets intended to “multiply creativity.” Each prompt offers instructions to achieve a goal or product. 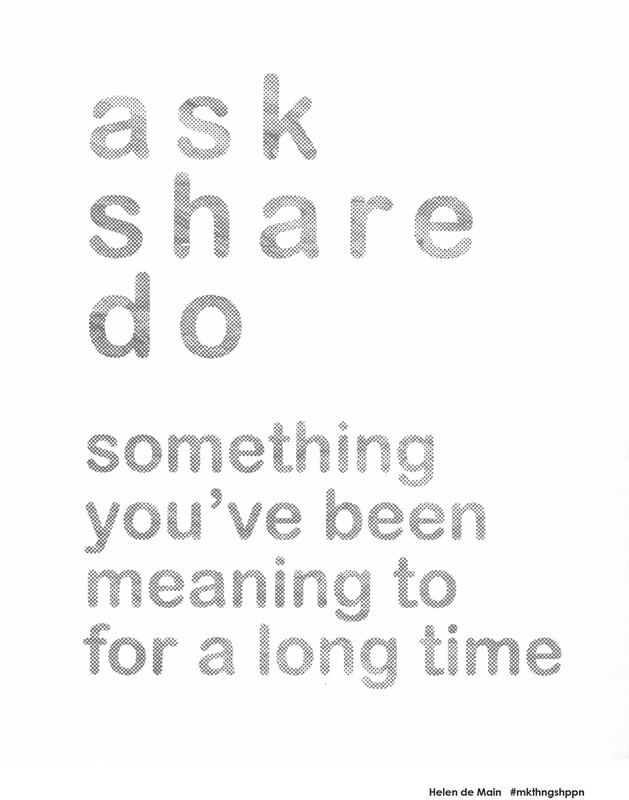 Some are succinct, such as Helen de Main’s, which simply reads “Ask/Share/Do something you’ve been meaning to for a long time.” Others are more involved, like Julie Perini’s instructions for white people trying to fight white supremacy, or Lexa Walsh’s instructions on how to facilitate a community meal and cookbook. Visitors can even learn how to use IKEA furniture pieces to build one of Sol LeWitt’s famous minimalist sculptures. All of the activity sheets are available in the gallery (486 49th St., Oakland) for the taking, and some are even set up in nearby spots like Lanesplitter Pizza, where the Mystic Pizza worksheet teaches you how to tell the future with your crust. Altogether the show is a fun and fascinating reminder that art is not only visual, but social as well. Catch it before it closes.